How would you like to earn an award for using your Camp-Inn Travel Trailer? Click on one of the awards shown below to find out what you need to do, to qualify. Awards are Lapel Pins about 1 inch tall. They have a butterfly clasp on the back. 1. Spend a cumulative 100 nights sleeping in your Camp-Inn trailer. b. Year, Model and Number of your Camp-Inn. d. Approximate number of MILES you traveled. e. Major trips or special things you did or saw. 4. The format of your travelogue is not critical, you can have it in story form, or a simple list of the facts. Does the first half of the trip to pick up my Camp-Inn count towards my total? Sorry, but no. Unless you are sleeping in your Camp-Inn it just doesn’t make sense to count those nights as part of the Total Nights. I took several trips before you guys came up with this award. Do all those nights qualify? Yes, those nights count, as long as they were in your Camp-Inn. I don’t have meticulous records of every night, is that a problem? We will take your word for it. We expect this to be an approximation. You may want to err on the low side, so you will be able to sleep. I didn’t take any pictures on my trips is that a problem? We would like you to share some of your pictures...but if you don't have any....I hope your memory is good. How many pictures should I submit? Well, “pictures” is plural, so that would imply at least two. We have gone over 200 nights already. How many pins do we get? Only one. For now, we only have a 100 night pin. If demand is high enough, we hope to make 250 and 500 night pins. My husband and I traveled together, do we get two pins? Only one pin is awarded. If you need a second one for your husband or to mount on your trailer, we will charge a small fee for the second one. We slept in our Camp-Inn, parked in our driveway. Do those nights count? Yes, but you should really try venturing farther from home. My teardrop is not a Camp-Inn. Can I still get a pin? Maybe… if you dreamed of sleeping in a Camp-Inn….. Hmmmmm….That’s a tough question! I’m going to have to sleep on it... Maybe for a 100 nights or so…..
Are these rules final? Maybe. 1. You must travel with your Camp-Inn trailer at least 5000 miles on a single trip. e. Number of nights or number of days. f. Major stops or things you saw on your trip. Does the first half of the trip to pick up my Camp-Inn count towards a long haul? Sorry, but no. 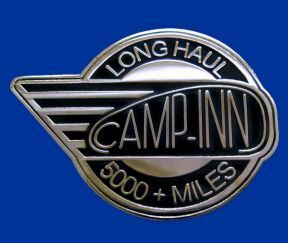 Unless you are ‘hauling’ your Camp-Inn it just doesn’t make sense to count those miles as part of the ‘Long Haul’. Does the 5,000 miles I drove over the summer as several smaller trips count as a Long Haul? While those miles do count towards your accumulated miles, a ‘Long Haul’ must be a single trip. I forgot to take any pictures of our trip to Alaska. Can I still get a pin? We would like you to show some pictures if at all possible. It makes it more interesting for others reading about your trip. How many pictures should I submit? How many bananas in a bunch? We drove the Trans-Siberia Highway five years ago. Do we get a pin? Yes, as long as you did it with your Camp-Inn. I took several side trips to see the largest ball of twine, a life size cow carved out of butter, and into town to get groceries. (my Camp-Inn stayed at the campground) Do those miles count toward the 5000? Yes, as long as one of the “side trips” wasn’t to go home. I put on 20 miles going back home 3 times for stuff I forgot to pack, does that count? If we allowed that, some people would qualify without even making it out of town. Each time you go home, the counter resets to zero. We have already been on three “Long Hauls.” How many pins do we get? As long as you post three separate sets of photos and stories, you will get one pin for each trip. I didn’t check the odometer when I left home, how do I tell how many miles I went? You can use a map or Google maps to figure out the miles traveled when you get home. Remember to account for all the side trips. (Side trips are usually 10-20% of the trip total ) Those suckers really add up! My wife and I traveled together, do we get two pins? Only one pin is awarded. If you need another one for your wife or to mount on your trailer, we will charge a small fee for the second one. My teardrop is not a Camp-Inn. Can I still get a pin? Yes, but it will have to be a really, REALLY good story and you have to say repeatedly how much more fun it would have been in a Camp-Inn. How can you have “Frequently Asked Questions” when you just started this? We keep asking ourselves the same thing. Are these rules written in stone? We have the stone, and we started writing, but the chisel got dull and my arm got tired, so….not yet. 1. Travel a cumulative 25,000 miles with your Camp-Inn trailer in tow. d. Approximate number of NIGHTS or number of DAYS. Does the first half of the trip to pick up my Camp-Inn count towards my total? Sorry, but no. 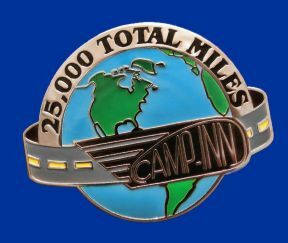 Unless you are ‘hauling’ your Camp-Inn it just doesn’t make sense to count those miles as part of the Total Miles. I took several trips before you guys came up with this BRILLIANT idea, (you guys are SO smart), do all those miles qualify? If we were that smart, we would have thought of this, years ago! Yes, those miles count, as long as they were in your Camp-Inn. I don’t have meticulous records of every mile I traveled, is that a problem? We aren’t the IRS, we will take your word for it. We expect this to be an approximation. I didn’t check the odometer when I left home, how do I tell how many miles I went? Take the trip again then multiply by 2! Or, you can use a map or Google maps to figure out the miles traveled when you get home. I put on 20 miles going back home 3 times for stuff I forgot to pack, does that count? Unlike the “Long Haul” pin, those miles do count toward your 25,000 Miles Total. I didn’t take any pictures on my trips is that a problem? Draw or paint a few pretty pictures... We would prefer to see a few pictures...if you have them to share. How many pictures should I submit? How long is a piece of string? We have gone over 60,000 miles already. How many pins do we get? Only one. For now, we only have a 25,000 mile pin. If demand is high enough, we hope to make 50,000 and 100,000 mile pins. My husband and I traveled together, do we get two pins? Sorry, only one pin is awarded. If you need a second one for your husband or to mount on your trailer, we will charge a small fee for the second one. Otherwise, you are going to have to arm wrestle him for it. I leave my trailer hooked to my car all the time. Do my commute-to-work miles count? Smart move! You have a kitchen to make lunch and can take a nap afterward. Take an alarm clock so you make it back to work on time. You have us on a technicality… So yes, these miles would qualify. I took a side trip to see the double-decker outhouse in Gays, IL. (my Camp-Inn stayed at the campground) Do those miles count? Yes. Side trip miles count as long as you are on a bigger trip. I got lost looking for the “Mystery Spot.” Do those miles count? Yes they count. Don’t think of it as getting lost, think of it as finding alternate destinations. Sometimes getting lost is the best way to find stuff. My teardrop is not a Camp-Inn. Can I still get a pin? Yes, but there will be a $20,000 processing fee. 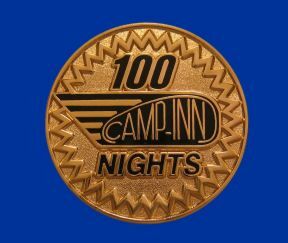 You will get the pin and a free Camp-Inn Teardrop. Are these rules hard and fast? We don’t think they are all that hard. And as for fast… they are just sitting here, unless of course you are scrolling, then the fastness depends on you!